Under construction, grossly incomplete at this time, but I am working on it. Sorry. Note: I generally disable Hyperthreading, since it causes massive slowdowns under some conditions, notably under X11. My user experience is better without faked cores. The results below are all without Hyperthreading. Big. Good quality, solid like the old IBM ThinkPads. Keyboard is good (I have an IBM ThinkPad X31, the keyboard of the T510i is comparable). Knoppix 6.2.1 boots both from DVD and from USB stick. I used it to repartition and to resize partitions using gparted. Here is the output that Kernel 2.6.34.4 produces for the usual hardware queries. Discussion of individual components follows below. For the impatient, here is my current kernel config file. The integrated LCD has a native 1600x900 resolution with non-glossy surface. Quality is pretty good. Nvidia GT218 [NVS 3100M] with 256MB (non-shared) video RAM. The GT218 chip gets unterclocked to increase stability and decrease power comsumption. The T510i has a single, 4 pin 3.5mm Audio connector on the right side, in front of the optical drive bay. It combines microphone input and speaker output. You can plug-in standard headphones with a 3 pin 3.5mm connector. 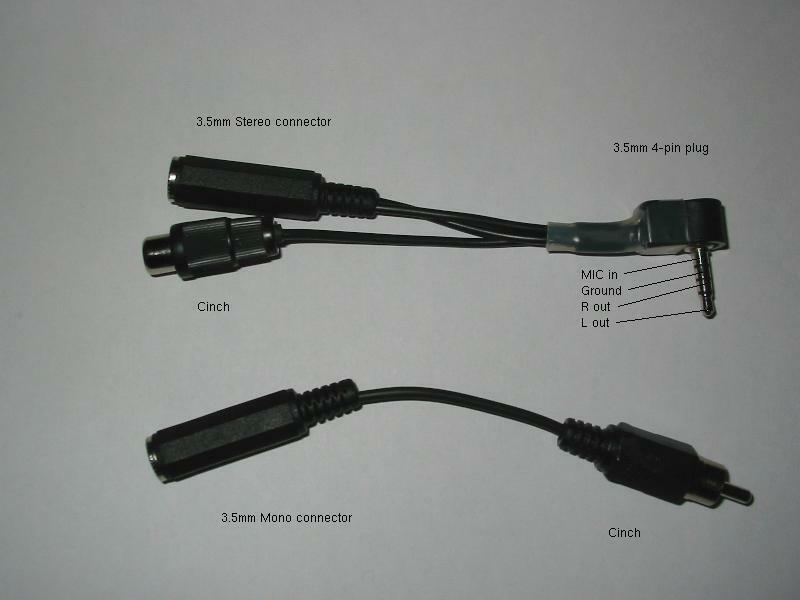 If you want to plug-in a microphone or both microphone and headphones, you need a set with the right connector or get/make an adapter. The problem here is that there are several different ways to assign the contacts and everybody seems to do it differently. The pinout for the T510i is in the picture of my adapter. If you decide to solder your own adapter or cable, make sure the microphone line is well shielded against the audio outputs. With the standard 4 pin plugs you can buy, this means to shield the audio outputs, as the MIC input is connected to what is usually ground. It also means that you have to use a plug with plastic body. I really hate it when hardware designers deviate from established standards, just to save 2 cents per unit. TODO: Speaker/MIC both disconnected on audio plugin? TODO: Speaker and not MIC disabled on headphone plugin? Here is a picture of my own adapter. The Cinch connector and additional adapter to 3.5mm is because my clip-on MIC has Cinch (my own modification after countless contact problems). There is a physical on/off switch for Bluetooth on the left side, towards the front. It reasults in an USB plug/unplug when changed. The USB Bluetooth device is an ??? 4 USB connectors, though one is a comined USB/eSATA connector. 3 are left, towards the front and one is on the back, right side. Left side towards the front, shared with one of the USB ports. Changing partition sizes with gparted worked without problem. Seems the NTFS support is mature. I did change the partition sizes after doing the Win 7 installation, it is possible that repartitioning first causes problems. Sorry, I do not have the original partitioning anymore, forgot to record it. I tried various non-proprietary options, but failed. However, the proprietary NVIDIA driver (v256.44) works for me. It can be downloaded from Nvidia. The istallation has gotten a lot better, in fact it worked on the first try. Per default, the installation script only installs the native resolution (1600x900). As of January, 2011, the current version of the NVIDIA driver (v260.19.29) works with Kernel 2.6.37, again without any problems. You can change resolution directly by calling xrandr as root, e.g. Calling xrandr without options gives you a list of available modes. Refer to the Lenovo service manual. Typically ThinkPads are pretty easy to open and it is rarely necessary.